Networking Takes Time – but you CAN get it right! The young man’s message to me this morning sounded so desperate, I paused from the presentation I was preparing. On my Facebook business page, I have hundreds of followers whom I don’t know personally. They may have heard me speak at an EDGE Communications Seminaror found me through my website or blog or some other means. Occasionally someone will reach out to me directly with a question or comment and I welcome that. No, I’m so sorry. I cannot. But I remember that same feeling of uncertainty when I was about to graduate. I was involved in a variety of activities at Indiana University. I had decent grades. Although I dreamed of becoming a television journalist, that was NOT the job I had lined up upon graduation. Far from it. My first job out of school was as a classified ads receptionist for the Orlando Sentinel. People called me to sell their couch, their car, their whatever. In today’s era of Ebay and Craigs list, this job doesn’t even exist anymore! Eventually, I did land my dream job as a CNN correspondent. But it took time! It’s May. Many college seniors are preparing to graduate. And like my young friend today, they too, may be looking ahead at a sea of uncertainty. So, this is the advice I gave the earnest sounding and polite young man today and I hope it encourages you too today. Yes, every word better be spelled correctly. Yes, the lay-out should be clean and simple. But it’s not enough to have lists and bullet points. Make your CV is the story of you. Google “Engaging resumes” and get some ideas. Whatever materials you hand out when you meet someone in person, make sure it reflects the “you” you want to be! We’re not born understanding what “Networking” means. Some think it’s only being interviewed for a job. It’s more than that. It’s getting yourself out to places where you can meet interesting people. Join Toastmasters or attend a free meeting at BMI. Talk to the people there. Tell them about yourself. And that means you better be able to talk about what it is you would like to be involved in. Practice what you would say about yourself. Out loud. Ask the people to whom you have been introduced to introduce you to more people. Get names and follow up. You MUST take the initiative. Not the other way around. Understand that networking TAKES TIME in the initial phase. I moved to Ireland in September. The first place I met other grown-ups was at my daughter’s school. I advise you not to be overly aggressive, but yes, this kind of place is most certainly one of opportunity. So, I casually mentioned upon meeting parents, that I am a communications consultant. One parent happened to work for a large multi-national beverage company. He asked if I provided training sessions. I said, “Yes!” We chatted a bit more and in November I met with the training director of that organization. I submitted a proposal to provide presentation training in advance of an event in February. I did NOT get that opportunity. But! Because, I believe, I had continued to check-in in a kind – not desperate – way, with the training director, she reached out to me again in early March about another opportunity in April. I submitted another proposal. And, voila, this past Monday, I was delighted to work with five executives from that company. Mind you, my initial meeting was in NOVEMBER! After the initial phase, your Networking can increase in momentum. Since Monday, I received my training evaluations. They were extremely positive! Each participant said they would recommend my training to others.The training director already emailed me to propose additional follow-up dates. Yey! How you handle your networking meetings and, of course, how you perform, can accelerate your momentum. Don’t wait for a single perfect meeting. Meet as many people as you can. If anything, it helps you practice how you present yourself and your goals. The journey from dreaded job to dream one is rarely a fast one. But is will pick up momentum as you make connections who help you make more connections and on and on. 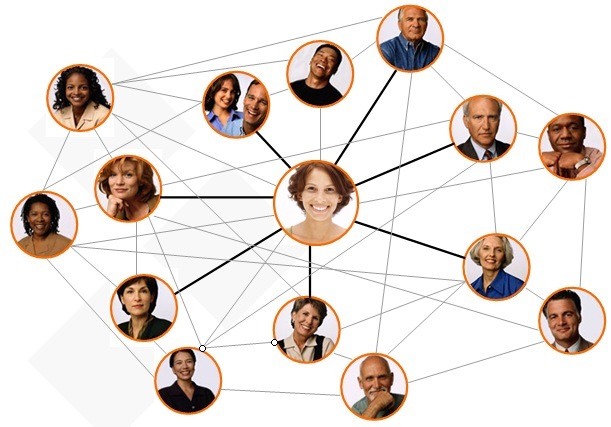 Think of your network as growing waves of concentric circles. They get wider, faster as you go along. But first, you have to work hard to drop that solid stone in the water to set the ripples in motion. The trick is to get going.